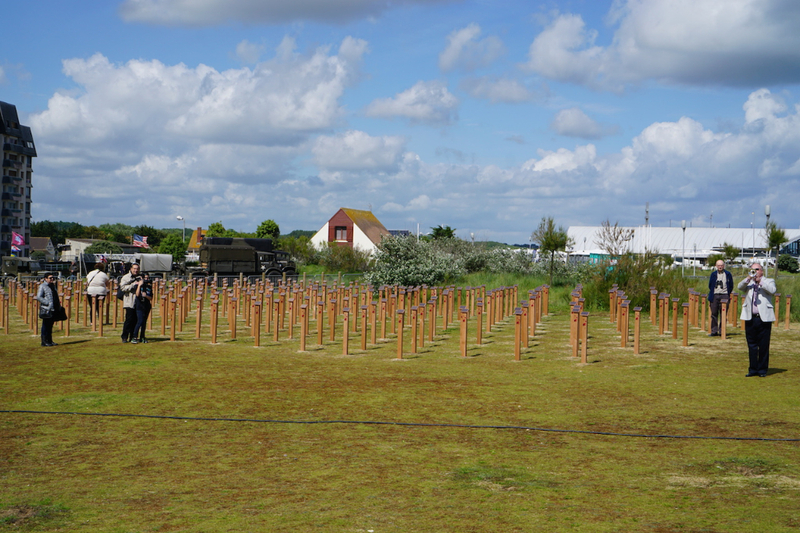 Canada’s D-Day Tribute honours the memory of those Canadian servicemen who lost their lives on 6 June 1944 through a sprawling installation on the grounds of the Juno Beach Centre in Normandy. To find out more about Canada’s D-Day Fallen, use the search function below to browse biographical information compiled by the Lest We Forget program and the generosity of those connected with these men. On 6 June 1944, 14,000 Canadians took part in the Allied invasion of Normandy, France that would eventually lead to an overall Allied Victory in European theatres of war. It would become known to history as D-Day. The Canadian Armed Forces suffered 5,500 casualties during the Normandy Campaign; 359 Canadians lost their lives on Juno Beach on the first day. 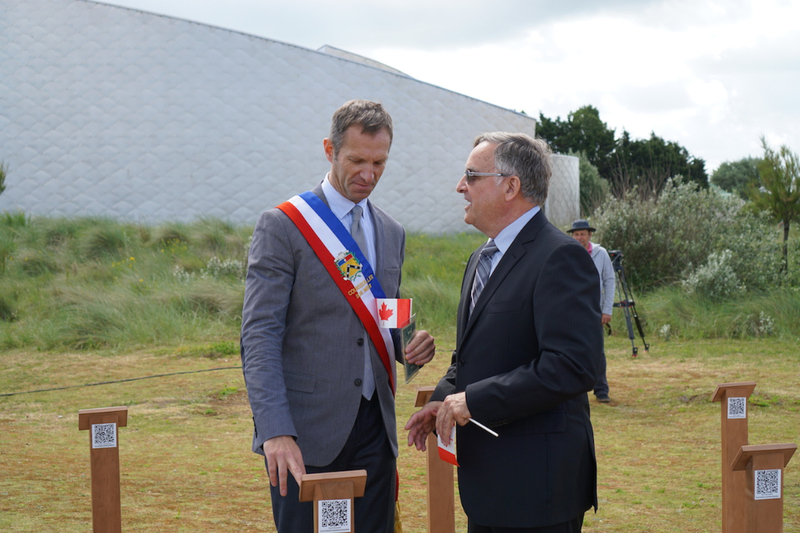 Throughout 2014, the Juno Beach Centre will commemorate the 70th anniversary of the D-Day Landings. This is a rare opportunity to draw special attention to the Canadian veterans who participated in the Normandy Campaign, including those who lost their lives on 6 June 1944. 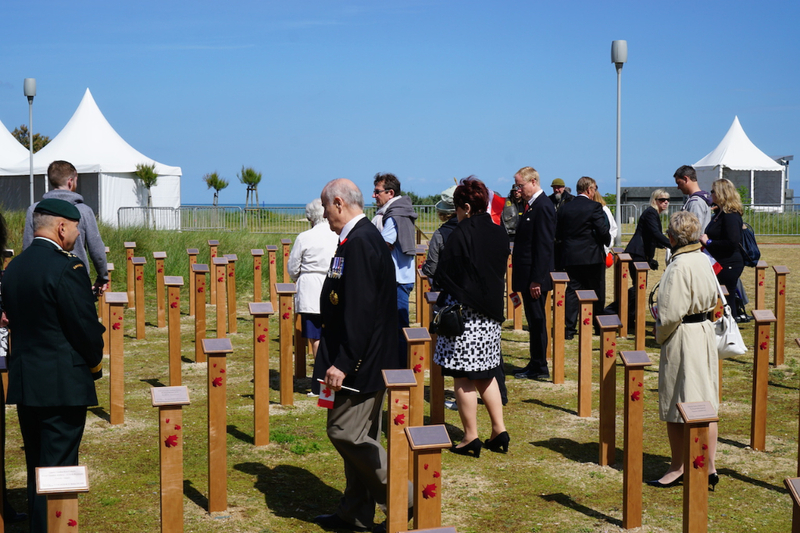 During the last week of May 2014, tribute markers – one for every Canadian killed on Juno Beach on 6 June 1944 – were installed on the grounds of the Juno Beach Centre. 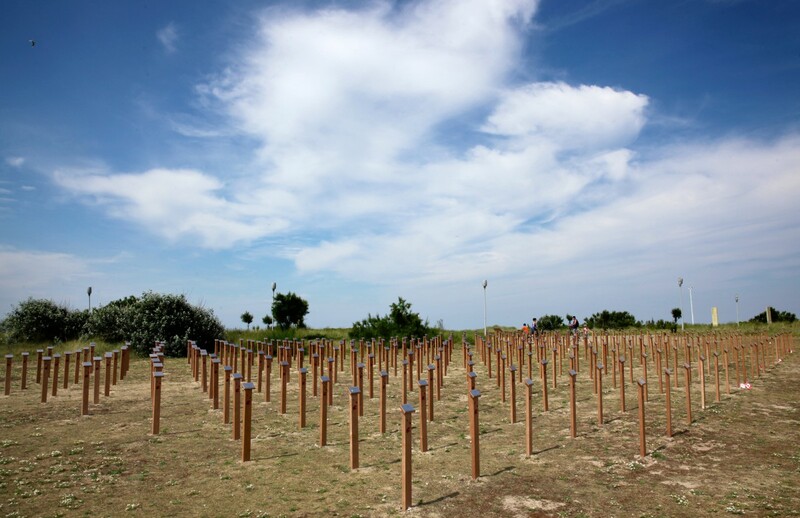 The markers stand a metre high and are made of Canadian maple. Each contains the name of a Canadian who died on D-Day, his hometown, and his regiment, along with the sponsoring organization or individual. 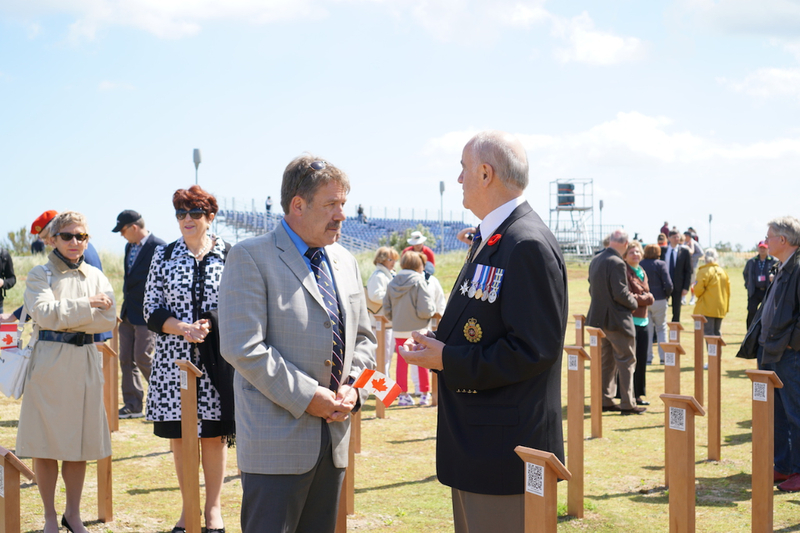 An inauguration ceremony was held on June 5, attended by French and Canadian citizens, veterans, and Minister of Veterans Affairs Julian Fantino. The men who died were more than just uniforms with names: they had stories, loved and were loved, and had plans for their lives after the war. To find out more about them, browse biographical information compiled by the Lest We Forget program and the generosity of those connected with these men. Thanks to the generosity of hundreds of supporters in Canada and France, each and every one of the 359 Canadians killed in action on June 6, 1944 was honoured as a part of this important 70th Anniversary initiative. 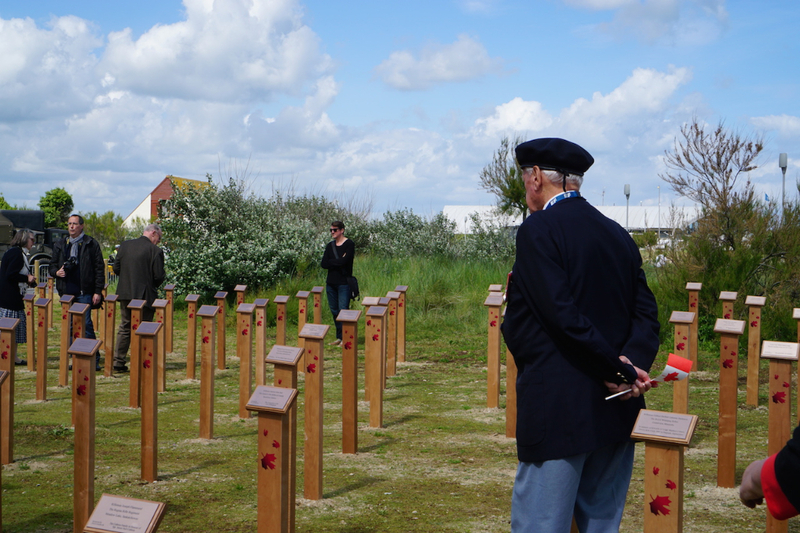 Visitors to the Juno Beach Centre were moved by the installation. 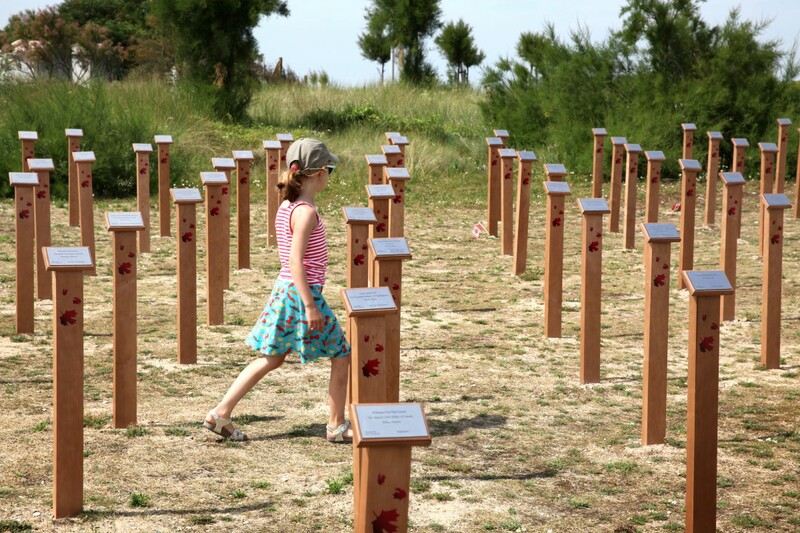 Over the past twelve months more than 100,000 people walked through the rows of Tribute Markers, reading the plaques and taking a moment to reflect on the brave Canadians being honoured. The Juno Beach Centre’s mandate is to remember and commemorate the sacrifices made by all Canadians during the Second World War and to educate current and future generations about the role of Canada in preserving the freedoms we are privileged to enjoy today. This campaign aims to raise awareness of the role Canada played in the D-Day landings and to honour those who lost their lives. 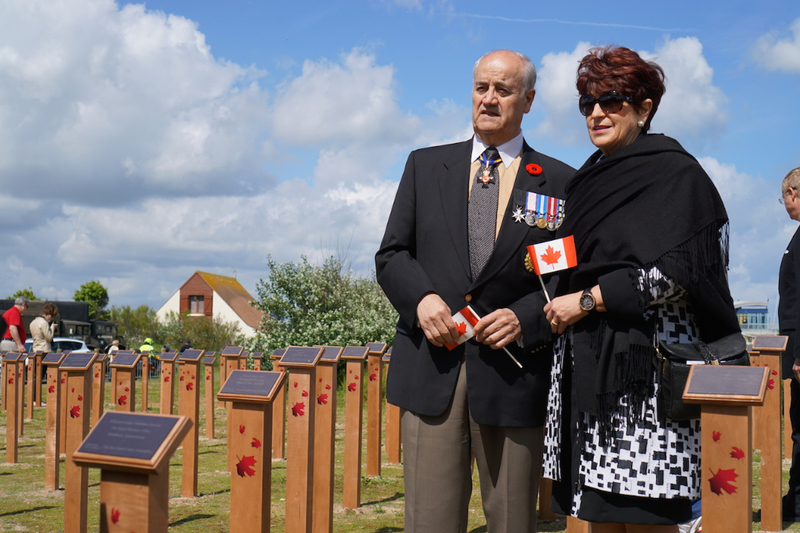 The funds raised will not only ensure the placement of the Tributes in time for the 70th anniversary of D-Day, but will also help to pave the way for future commemoration and education efforts by the Juno Beach Centre. Specifically, the funds will continue to be used to honour the memory of Canadians who fought and died in the Second World War.